In the present study, we aim to utilize the ecological diversity of soil for the isolation and screening for poly β-hydroxybutyrate (PHB)-accumulating bacteria and production of cost-effective bioplastic using cardboard industry effluent. A total of 120 isolates were isolated from different soil samples and a total of 62 isolates showed positive results with Nile blue A staining, a specific dye for PHB granules and 27 isolates produced PHB using cardboard industry effluent. The selected isolate NA10 was identified as Bacillus sp. NA10 by studying its morphological, biochemical, and molecular characteristics. The growth pattern for the microorganism was studied by logistic model and exactly fitted in the model. A maximum cell dry weight (CDW) of 7.8 g l−1 with a PHB concentration of 5.202 g l−1 was obtained when batch cultivation was conducted at 37°C for 72 h, and the PHB content was up to 66.6% and productivity was 0.072 g l−1 h−1 in 2.0 L fermentor. Chemical characterization of the extracted PHB was done by H1NMR, Fourier transform infrared spectroscopy (FTIR), thermal gravimetric analysis (TGA), Gas chromatography–mass spectrometry (GC-MS) analysis to determine the structure, melting point, and molecular mass of the purified PHB. The polymer sheet of extracted polymer was prepared by blending the polymer with starch for packaging applications. The isolate NA10 can be a good candidate for industrial production of PHB from cardboard industry waste water cost-effectively and ecofriendly. Today, plastics have become a necessary part of contemporary life due to their durability and resistance to degradation. 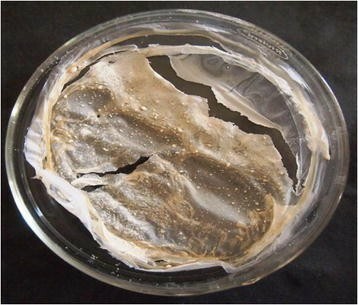 Worldwide production of petroleum-based synthetic polymer was approximately 270.0 million tons in 2007 , and these synthetic polymers are found to be recalcitrant to microbial degradation . Problems related to solid waste management of these petrochemical-derived plastics pose a serious threat to global environment. Therefore, current concern about the environmental fate of polymeric materials have created much interest in the development of biodegradable plastic (bioplastic), such as starch derivatives, polylactic acid, cellulosic polymers and polyhydroxyalkanoates, which plays an important role. In addition to being biodegradable, they have further advantage of being produced from renewable resources . Among the various biodegradable polymer materials, polyhydroxyalkanoates (PHAs) provide a good fully degradable alternative to petrochemical plastics ,. Polyhydroxybutyrate (PHB) was the first PHA to be discovered and is also the most widely studied and best characterized PHA. It is accumulated as a membrane enclosed inclusion in many bacteria at up to 80% of the dry cell weight and nearly 90% in recombinant E. coli. In addition to the easy biodegradability and biocompatibility, it has mechanical properties that are very similar to conventional plastics like polypropylene or polyethylene and have many domestic and commercial applications such as food packing films, biodegradable carriers for medicines and insecticides, disposable cosmetic products, absorbable surgical devices and being immunologically compatible with human tissue can form microspheres and microcapsules . Recently, PHA has been found useful as a new type of biofuel . Besides all these properties and applications, wider use of PHAs is prevented mainly due to their high production cost compared with the oil-derived plastics . High production cost of PHB production is mainly devoted to the expensive carbon substrates and tedious production procedures . Due to the large impact of the high price of carbon sources on production costs, one of the most important approaches to reduce costs is to use wastes and by-products as raw material for the fermentation process. Novel technologies have been developed to produce PHAs from organic matters in wastewater -, industrial wastes ,, municipal waste , food wastes , and activated sludge of paper and pulp mills . Hence, replacement of non-biodegradable with biodegradable plastic from organic waste can provide multiple benefits to the environment and contribute to sustainable development . Therefore, organic waste from cardboard industry waste water could be a good approach for cost effective production PHA. For the isolation of PHA-producing bacteria, various soil samples were collected from different ecological niches. The samples were stored at room temperature until analysis. In 99 mL sterilized water, 1 g of soil sample was mixed. Then, the sample was serially diluted in sterile distilled water and followed by plating on the carbon-rich nutrient agar medium (beef extract 0.3%, peptone 0.5%, sodium chloride 0.5%, glucose 1%, and agar 2%). For the rapid detection and isolation of PHB-producing bacteria, 0.02% alcoholic solution of Sudan black B was applied to stain bacterial colonies and the plates were kept undisturbed for 30 min. The excess dye was then decanted, and plates were rinsed gently by adding 100% ethanol. Colonies unable to incorporate the Sudan black B appeared white, while PHB producers appeared bluish black . The Sudan black B-positive isolates were further screened by Nile blue A, a more specific stain for PHA by a more rapid and sensitive, viable colony method . This dye at concentrations of only 0.5 μg/mL was directly included in carbon-rich nutrient agar medium, and growth of the cells occurred in the presence of the dye. The PHA-accumulating colonies, after Nile blue A staining, showed bright orange fluorescence on irradiation with UV light and their fluorescence intensity increased with the increase in PHA content of the bacterial cells. The isolates which showed bright orange fluorescence on irradiation with UV light after Nile blue A staining were selected as PHA accumulators. The selected PHA accumulators after Nile blue A staining were checked for growth and PHA production in both nutrient broth (beef extract 0.3%, peptone 0.5%, sodium chloride 0.5%) and cardboard industry effluent. Untreated cardboard industry effluent was collected from the cardboard industry, Yamunanagar (Haryana), India, and stored at 4°C until used for analysis. The effluent was first filtered through the muslin cloth and then through rough filter paper to remove the undesired suspended solid materials from waste water. After this pretreatment step, cardboard industry waste water was used as quantification and production medium for PHA production by selected bacterial isolate. Microscope Stereo Olympus (America) was used to observe the morphology of bacterial colonies grown on nutrient agar. The growth characteristics such as structure, shape, color, margin, surface characteristics, elevation, cell's arrangement, and Gram staining of the bacterial colonies were observed to characterize the bacterial colonies. Various biochemical tests were performed in selected PHB-producing bacteria, namely, indole production test, methyl red and Voges-Proskauer, citrate utilization test, and H2S production for their biochemical characterization. The fermentative utilization of various carbohydrates (xylose, mannose, maltose, sucrose, raffinose, dextrose, trehalose, fructose, glucose, ribose, lactose, rhamnose, esculin, inulin, mannitol, arabinose, sorbitol, and melibiose) were also followed for 48 h at 37°C by inoculating the selected isolate separately in the defined medium to which various sugars were added. Colony polymerase chain reaction (Colony PCR) of the isolate was performed according to Gen Elute™ Bacterial genomic DNA kit (Sigma, St. Louis, MO, USA), and the colonies (approximately 1 mm in diameter) were picked up with a sterilized toothpick and directly transferred to the PCR tubes as DNA templates. The PCR amplification of 16S rRNA was done at 94°C for 4 min, 94°C for 20 s, 52°C for 30 s, 72°C for 2 min, and 72°C for 7 min with hold at 4°C. The universal primer 16sF-5′ AGA GTT TGA TCC TGG CTC AGA 3′ and 16sR-5′ ACG GCT ACC TTG TTA CGA CTT 3′ were used. PCR-amplified DNA fragments were observed by agarose gel electrophoresis in 1% ± agarose gels (FMC). Ten microliters of each amplified mixture and the molecular mass marker were subjected to agarose gel electrophoresis and ethidium bromide staining and tracked by 0.25% of bromophenol blue. The ampli®ed DNA fragments were visualized by gel documentation box (Genie, Redmond, WA, USA). After that, the PCR product was purified by GenElute™ gel extraction kit (Sigma) method and sequencing of PCR product was done by Sanger sequencing method at 96°C for 1 min, at 96°C for 15 s, at 52°C for 30 s, and at 60°C for 4 min for 25 cycles with a hold at 4°C. The ABI Prism Big Dye Terminator Cycle Sequencing Ready Reaction Kit (Applied Biosystems, Foster City, CA, USA) was used for the sequencing of the PCR product. A combination of universal primers was chosen to sequence the gene sequence. Samples were run on an ABI Prism 3130×1 Genetic Analyzer (Applied Biosystems). The chromatogram was made by Chromas 2.4. software. The obtained sequence was subjected to search for closest possible species by BLAST tools and distance matrix tree tool available at National Centre for Biotechnology Information (NCBI). Phylogenetic tree was constructed by MEGA5.2 phylogenetic tree analysis software. The optimization for maximum PHA production by selected isolate was carried in 250-ml Erlenmeyer flask using preprocessed cardboard industry waste water as production medium at 100 rpm. Several cultural parameters were evaluated to determine their effect on biomass and PHB production using cardboard industry waste water. The optimized value for each parameter was selected and kept constant for further experiments. Several cultural parameters like production media concentration (25%–100%) time of incubation (24–96 h), temperature of incubation (25°C–55°C), and effect of pH (5.5–8) were evaluated to determine their effect on biomass accumulation and PHA production. The production of PHAs was carried out in a 2.0-L fermenter (Minifors CH 4103, Switzerland) with a working volume of 1.25 L using the optimized parameters and production medium. Initially, the production medium (preprocessed undiluted cardboard industry waste water) was added into the fermenter, the pH was adjusted to 7.0, and the medium was sterilized in situ. Dissolved oxygen was maintained at 80%–100% air saturation; at the start of the process, 1% (v/v) of overnight culture (at log phase) was inoculated aseptically and the impeller speed was maintained at 100 rpm and temperature at 37°C. The pH was maintained at 7.0 using 1 N NaOH and 1 N HCL. Antifoam (silicone oil) at a concentration of 1:10 (v/v) in water was added after 36th and 54th hour. The growth curves (DCW vs. time) were prepared to determine the start and end point of exponential phase for NA10 in batch fermentation. Various other growth parameters such as maximum specific growth rate (μ) and doubling time (Td) were determined according to the method provided by Painter and Marr  and Levasseur et al. .
where wt2 and wt1 are the dry cell weight at the different time points (t1 and t2), respectively. where Td is the doubling time and μm is the maximum specific growth rate. Cell dry weight (CDW) and PHB yield coefficient relative to cell dry weight (Yp/x, g/g, defined as gram PHB produced per gram dry cell mass produced) , PHB concentration (g/L, defined as g PHB measured in 1 L culture), PHB content [g/g, defined as the ratio of PHB concentration (g/L) to dry cell concentration (g/L)], and PHB productivity (g/L/h) , were measured and calculated per definition during the fermentation process. All experiments were performed in triplicate to check the reproducibility. The results were analyzed statistically by determining standard deviations values and performing analysis of variance (ANOVA) test. For extraction and quantitative analysis of PHB, culture broth was centrifuged at 8,000 rpm for 15 min after 72 h of incubation at 37°C. The pellet dissolved in 10 mL sodium hypochlorite was incubated at 50°C for 1 h for lyses of cells. The cell extract obtained was centrifuged at 12,000 rpm for 30 min and then washed sequentially with distilled water, acetone, and absolute ethanol. After washing, the pellet was dissolved in 10 mL chloroform (AR grade) and incubated overnight at 50°C . After evaporation at 50°C, 10 mL of sulfuric acid was added to it and placed in water bath for 10 min at 100°C. This converts PHB into crotonic acid, which gives absorbance maximum at 235 nm ,. PHB (Sigma Aldrich) was used as standard for making standard curve. The identity of individual monomer unit was confirmed by proton nuclear magnetic resonance (1H-NMR) spectroscopy. 1H-NMR spectra were acquired by dissolving the polymer in deuterated chloroform (CDCl3) at a concentration of 10 mg/ml and analyzed on a Bruker Avance II 500 spectrometer (Madison, WI, USA) at 22°C with 7.4 ms pulse width (30° pulse angle), 1 s pulse repetition, 10,330 Hz spectral width, and 65,536 data points. Tetramethylsilane was used as an internal shift standard. FTIR analysis of the polymer sample was carried out on MB-3000, ABB Fourier transform infrared (FTIR) spectrophotometer in the range 4,000 to 600 cm−1. Thermal gravimetric analysis (TGA) was performed using a TGA instrument (Perkin Elmer, Diamond TG/DTA analyzer, USA) calibrated with indium. The temperature was ramped at a heating rate of 10°C/min in nitrogenous environment to a temperature (700°C) well above the degradation temperature of the polymers. For molecular analysis of purified polymer, a coupled Gas chromatography–mass spectrometry (GC-MS) was performed using a GC-MS-QP 2010 Plus model, with capillary Column-Rtx-5 MS (30 m × 0.25 mm i.d. × 0.25 μm film thickness). The samples were injected (3 μL) in the splitless mode, and the injection temperature was 260°C and column oven temperature was 100°C. The mass spectra obtained were compared with the Nist-08 and Willey-08 mass spectral library. A wide variety of bacteria are known to accumulate PHA granules intracellularly as an energy reserve material. Microbial species from over 90 genera have been reported to accumulate approximately 150 different hydroxyalkanoic acids as polyhydroxyalkanoate polyesters granules ,. These bacteria have been reported from various environments. For the rapid detection and isolation of PHB-producing bacteria, 0.02% alcoholic solution of Sudan black B and Nile blue A, viable colony method  was used. The isolation of PHA-producing bacteria was done from various ecological niches. A total of 120 isolates showed black-blue coloration when stained with Sudan black B, a preliminary screening agent for lipophilic compounds, and a total of 62 isolates showed positive result with Nile blue A staining, a specific dye for the presence of PHA granules. Teeka et al. used this method to screen the potential PHA-producing bacteria from soil, and Ramachandra and Abdullah  also observed the colonies formed on nutrient-rich medium under ultraviolet light (UV) to screen for the pink fluorescence which indicated the presence of PHA producers. Kitamura and Doi  first demonstrated this viable colony method on agar plates; they induced the isolates to accumulate PHA by culturing in E2 medium, containing 2% (w/v) glucose before Nile blue A staining. The PHA-accumulating colonies, after Nile blue A staining, showed bright orange fluorescence on irradiation with UV light and their fluorescence intensity increased with increase in PHA content of the bacterial cells. The PHA-positive isolates selected after Nile blue A staining were screened in nutrient broth and best 27 producers were grown in processed cardboard industry waste water in 250-mL Erlenmeyer flasks and were employed to extract PHB after 72 h of incubation under stationary conditions of growth. The PHB from the isolates was extracted by the hypochlorite and chloroform method  as described earlier. The isolate NA10 showed maximum PHB production in both nutrient broth and cardboard industry waste water (3.951 g/L) (Table 1) and were selected for further optimization of PHB production. Growth and production of PHA in nutrient broth and preprocessed cardboard industry waste water after 72 h of incubation at 37°C. Organic matter from waste and wastewater have high biological oxygen demand (BOD) and carbon oxygen demand (COD) values and, hence, microorganisms can grow, utilizing the nutrient present in waste water and can convert them into valuable compounds and polymers. Based on this idea, many researchers reported the PHA production from various industrial waste materials. Many researchers have proposed coupling PHA production to biological wastewater treatment -. Rebah et al. utilized two types of industrial wastewater (starch and slaughterhouse wastewater from a plant located around Quebec region) and a secondary sludge (Quebec municipal waste water treatment plant) for PHB production by cultivating fast-growing Rhizobia but the PHB production was very low up to 10%. In an another study, Mockos et al. reported that selectively enriched pulp mill waste activated sludge can serve as an inoculum for PHA production from methanol-rich pulp mill effluents, and the enriched cultures accumulated nearly 14% PHA on a dry weight basis under nitrogen-limited conditions. Cardboard industry waste water is typically rich in carbohydrates but poor in fixed nitrogen due to the high C/N ratio. This high carbon-nitrogen ratio favors the growth of PHA-producing bacteria. This waste have high BOD and COD values 680–1,250 mg/L and 3,400–5,780 mg/L and COD/BOD ratio between 3.9–5 , which is suitable for microbial growth. By using Bergey's manual of determinative bacteriology  and by ABIS online, advanced bacterial identification software, the selected isolate was classified up to genus level using the morphological and biochemical characteristics (Tables 2 and 3) and was identified as Bacillus sp. For further characterization, almost complete 16S rRNA gene sequences were determined. The obtained sequences were aligned and compared with the bacterial sequences available in the GenBank database. 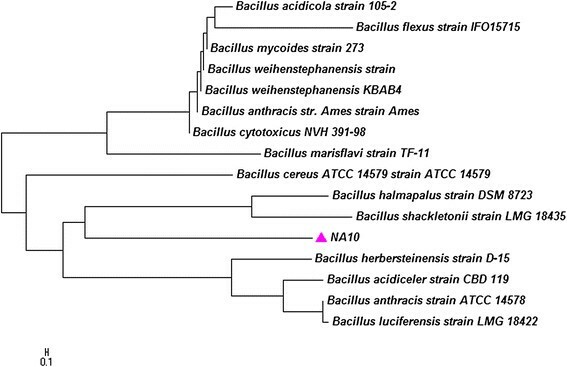 The phylogenetic analysis (Figure 1) was done using MEGA 5.2 software by neighbor-joining tree and distance matrix-based nucleotide sequence homology which revealed that isolate NA10 is Bacillus sp. Yilmaz et al. isolated 29 strains of the genus Bacillus from different soil samples which were taken from grasslands of Ankara, Turkey, and the highest PHB production and productivity percentage was found in Bacillus brevis M6 (41.67% w/v). Neighbor-joining phylogenic tree made by MEGA 5.2 software of isolate NA10. As such, there is no report available from literature for PHB accumulation by microbial cells using cardboard industry waste water. The growth of Bacillus NA10 was recorded in different concentration of cardboard industry waste water (Figure 2), and the maximum growth was noted in undiluted (100% v/v) cardboard industry waste water after 72 h of incubation at 37°C. Dilution of waste water not only affected the microbial growth but also the PHB accumulation. This may be due to the fact that with increasing dilution of waste water, the carbon and other nutrient got diluted and was not able to support microbial growth . By submerged fermentation, Bacillus sp. NA10 accumulated highest PHB (3.952 g/L) from undiluted processed cardboard industry waste water in unoptimized cultural conditions. Quagliano et al. studied the effect of molasses concentration on PHB by increasing the molasses concentration from 1% to 5% (w/v), and a maximum of 54% PHA was obtained with 5% molasses concentration with highest Mw 640 kDa. Pozo et al. found that NH4 medium amended with 60% alpechin showed the maximum PHA production and concluded that alpechin was tolerated by A. chroococcum strain H23 at high concentrations and that it acts as a substrate to support the growth of the microorganisms. 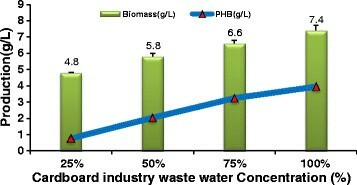 Growth pattern and PHB production in cardboard industry waste water. The PHB production in cardboard industry waste water was followed for 120 h by submerged fermentation in 250 mL Erlenmeyer flask at an interval of 24 h. The production of PHB increased up to 72 h (4.456 g/L) and, thereafter, got reduced (3.26 g/L after 72 h) (Figure 3a). This reduction in PHB production after 72 h may be due to lack of micronutrients as well as increase in metabolites that might have negative effect on the PHB production. The observation was supported by Yüksekdağ et al. Alcaligenes eutrophus and A. vinelandii. Klüttermann et al. also reported that the highest PHB level in Agrobacterium radiobacter was achieved after 96 h. After this time, the PHB contents in fermentation broth decreased which might indicate that the bacteria used PHB as a nutrient source due to inadequate nitrogen and carbon sources in the medium. Optimization of various cultural and growth parameters for Bacillus sp. NA10. (a) time (b) temperature (c) pH for Bacillus sp. NA10. 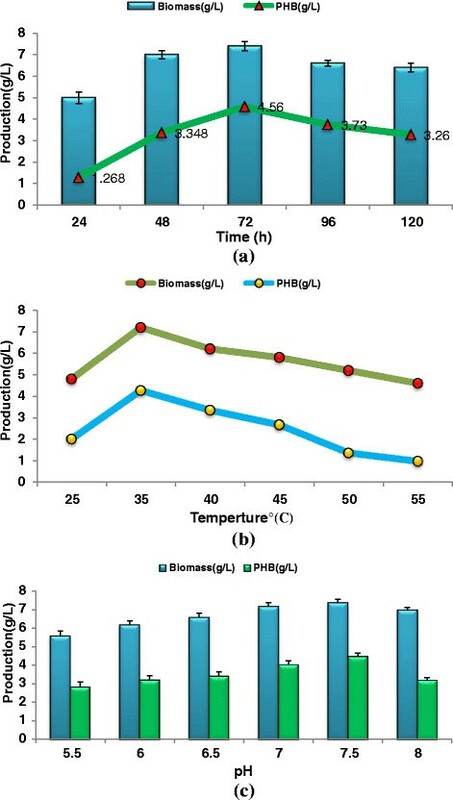 The maximum PHB production of 4.274 g/L was recorded at 35°C after 72 h. The increase of temperature beyond 35°C has negative impact on PHB production (Figure 3b). This decrease in PHB production at high temperature is also supported by studies of Grothe et al. and Yüksekdağ et al. . The decrease in PHB production at high temperature could be due to low PHB polymerase enzyme activity . Tamdoğan and Sidal  also reported that higher and lower temperatures than 30 C lead to decrease in cell biomass and PHB synthesis by Bacillus subtilis ATCC6633.This result coincides with that represented by Aslim et al. , Hamieh et al. , who reported that optimum incubation temperature for PHB production by Bacillus subtilis , Bacillus pumilis and Bacillus thuringiensis was 37 C.
Typically, metabolic process was highly susceptible to even slight changes in pH. Therefore, proper control of pH was critical. The experimental results showed that highest PHB content (4.492 g L−1) was obtained at pH 7.5 by isolate NA10 (Figure 3c). The current observation was in agreement with Sindhu et al. who observed that the maximum PHB was produced (0.01 to 0.5 g/L) at pH 7–7.5 by Bacillus sphaericus NII 0838 from crude glycerol. Flora et al. revealed that the maximum PHB production (25%) by B. sphaericus was at pH range from 6.5–7.5, and the reduction of polymer accumulation at higher pH values is due to the effect on the degradative enzymes of polymer breakdown, so that PHB is utilized at a rate almost equal to the rate of its synthesis. Shivakumar  also reported that pH 6.8 to 8.0 was optimum for PHB production by A. eutrophus. Growth kinetics of the culture was studied in 2.0 L lab scale bioreactor. The profiles of PHB accumulation were analyzed in batch cultivation by growing on the cardboard industry waste water under optimized growth conditions obtained at flask level (Figure 4). The growth pattern for the microorganism was studied by logistic model and exactly fitted as presented in Figure 5. The bacteria NA10 was found to accumulate cell dry weight and specific product yield after the initial logarithmic growth (24 h) and reached a maximum 7.8 g/l at a rate 0.028 h−1 in stationary growth phase at 72 h. Similarly specific product yield (Yp/x) increased by about 50% from initial exponential growth to stationary phase, suggesting that cells accumulated PHB while growing and aging; hence, any strategy that prolongs the stationary phase is likely to further enhance the PHB yield per unit biomass. 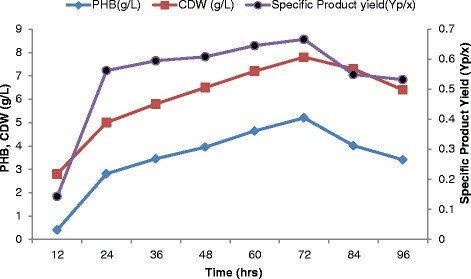 A maximum CDW of 7.8 g l−1 with a PHB concentration of 5.202 g l−1 was obtained when batch cultivation was conducted at 37°C after 72 h, and the PHB content was up to 66% and productivity was 0.072 g l−1 h−1. Tanamool et al. reported that maximum 0.920 g/l of cell dry mass and 0.034 g/l PHB using sweet sorghum juice by Ralstonia eutropha with yield and productivity of 0.037 g PHB/g dry cell and 0.0019 g/(l h), respectively. Similarly, El-Sayed et al. 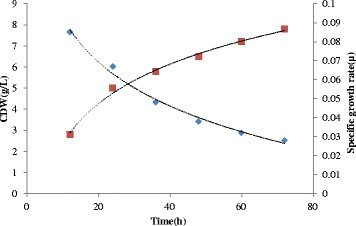 found specific growth rate of 0.055 h−1on sucrose media while a specific growth rate of 0.053 h−1 was obtained with R. eutropha on glucose medium. Cell dry weight, specific product yield (Yp/x), and PHB production by Bacillus sp. NA10 in 2.0 L fermenter. Logarithmic growth curve of Bacillus sp. NA10 in cardboard industry effluent. The structures of polyesters were investigated by 1H NMR (Figure 6a). The 1H NMR spectra of the PHAs extracted from Bacillus sp. NA10 shows a doublet at 1.26 ppm which is attributed to the methyl group coupled to one proton, a doublet of quadruplet at 2.580 ppm which is attributed to a methylene group adjacent to an asymmetric carbon atom bearing a single proton, and a multiplet at 5.25 ppm characteristic of the methyne group. Two other signals are also observed, the broad one at 1.04 ppm which is due to water, and another one at 7.27 ppm which is attributed to chloroform. From these results, it can be concluded that Bacillus sp. NA10 cells grown with cardboard industry effluent as the carbon source produce PHA exclusively in the form of PHB. (a) NMR spectra (b) FTIR spectra (c, d) GC-MS of extracted polymer. Polymer extracted from NA10 was used for recording IR spectra in the range 4,000 to 600 cm−1. IR spectra (Figure 6b) showed two intense absorption band at 1,720 and 1,273 cm−1 which are specific for C = O and C–O stretching vibrations, respectively. The absorption bands at 2,932 and 2,962 cm−1 are due to C-H stretching vibrations of methyl and methylene groups. These prominent absorption bands confirm the structure of poly-β-hydroxybutyrate. TGA curves were obtained in the temperature range of 30°C to 700°C for PHB. TGA results of Bacillus sp. NA10 showed that the Tm is 182.34°C, and the enthalpy of PHA fusion is 83.62 J/g. The result showed similarity with the data obtained from standard PHB (174.29°C and 86.49 J/g) and from other works ,. The PHA gave a rapid thermal degradation between 250°C and 290°C while the standard PHB represented at between 250°C and 295°C. It is indicated that biopolymeric material obtained can possibly be further used in a large-scale processing of bioplastic ,. GC-MS analysis helps in elucidating the structure of components. The key compounds of concern were identified based on their retention peak. PHA from Bacillus sp. NA10 cultured in processed cardboard industry waste significantly contained hexadecanoic acid, methyl ester (56%), and tetradecanoic acid (32%). These compounds signify that the monomer chains were of biodegradable polyester family . Figure 6c,d shows that a common molecular fragment of the 3HB ion chromatogram of the PHB was produced. A predominant peak corresponding to the tetramer of 3HB (hexadecanoic acid) was noted at 13.639 to 13.88 min, respectively, in GC-purified product from Bacillus sp. NA10. The retention times and ion fragment patterns of the peaks at 11.6, 12.24, and 15.73 min were identical to those of the dimer methyl esters of 3HV and 3HBV, respectively, but in low percentage up to 32% and 11%, respectively. The similar results of GC-MS were observed by He et al. with 3-hydroxydecanoate (HD or C10) 63% and 3-hydroxyoctanoate (HO or C8) 21% with other medium chain length (mcl) monomers. From the data obtained by GC-MS, the molecular weight of PHB obtained from isolate Bacillus sp. NA10 is 242 kDa while, the commercial PHB have a molecular weight of 275 kDa. Galego et al. extracted the PHB with a molecular weight of about 177 kDa. This lowering in molecular weight is due to the presence of other polyhydroxyalkanoic acids e.g. 3HV and 3HBV up to a low percentage (32%) with major polymer 3HB. The PHB produced was found to be brittle and breaks easily. Blending PHB with other polymers is an economic way to improve its mechanical properties. The PHB blend sheet (Figure 7) was prepared by mixing extracted polymer with soluble starch following the conventional solvent cast technique. Starch is used for blending because it has few advantage of being biodegradable, biocompatible, cheap, and also readily available while all other biodegradable polymer such as polyethylene glycol and polylactic acid are costly. Starch-blended sheet shows better mechanical and thermal properties making it more reliable for packaging industry. As PHB and starch was not completely miscible, the blend showed insoluble particle aggregation on the surface. Identical observations were reported by Choi et al. in which they prepared PHB sheet with EPB blends. The blends showed a higher thermal stability compared to PHB sheet. Parra et al. reported PHB blend preparation with polyethyleneglycol (PEG) with improved properties. In this study, inexpensive cardboard industry waste water was tried as a carbon source to produce PHB. Different bacterial strains were isolated from soil and screened for polyhydroxybutyrate production using cardboard manufacturing industry waste water as a carbon source. The bacterial isolate Bacillus sp. NA10 can be regarded as potential strain for conversion of cardboard industry waste water into PHB. The selected isolate efficiently utilized cardboard industry waste water as sole carbon source for growth and PHB biosynthesis, accumulating PHB up to 66.6% of the cell dry mass with 0.072 g l−1 h−1 productivity. Currently, this bacterial strain is further studied to increase the productivity of PHB by studying the effect of various carbon and nitrogen supplementation in cardboard industry waste water. The authors express their sincere gratitude to the Rana Cardboard industry, Yamuna Nagar, for providing the untreated waste water. The authors are very thankful to the Department of Chemistry, Kurukshetra University, Kurukshetra, for providing the necessary facilities for NMR, FTIR, and TGA analysis of the polymer. AKB carried out all the experimental work such as isolation, screening, fermentation studies, chemical, and statistical analysis and drafted the manuscript. GS (Gulab Singh) collected the substrate and helped in fermentor running and chemical and statistical analysis. NKA guided all the research work and participated in the design of the study. VG and AY helped in isolation and screening and provided the moral support in the whole study. All authors read and approved the final manuscript.